Frequently, when people hear the term “divorce litigation,” they immediately think of a couple, each of them lawyered up, waging a hugely expensive, rancorous, and time-consuming battle in court. While that can happen, that sort of thing doesn’t occur too often. Divorce litigation is essentially a legal term that refers to the process of carrying out a lawsuit. It’s arguably the most traditional method of divorce, in which two family law attorneys resolve a legal conflict in front of a judge. Remember the example we offered earlier? The fact is that approximately 90% of all divorce cases end up settling out of court. That’s because most people simply want their end of the divorce deal to be fair, whether it’s an alimony agreement or the division of real and personal property. So, when is litigation required? Usually, it results from one or both parties being unreasonable or if there are disagreements regarding the distribution of assets and debts. Divorce litigation more often results in child custody matters because it is such a personal and emotionally–charged issue. Resolving divorce through litigation is typically a drawn-out process, which can also make things more expensive as opposed to mediation or arbitration. But when you hire an attorney for litigation, you’ve got someone who represents your interests, is able to educate you about the often indecipherable legal process, and let you know when a potential deal is a good or bad move. 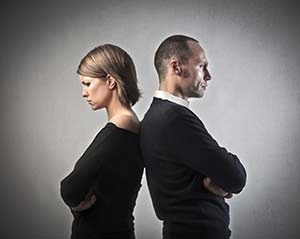 Divorces have an enormous effect on spouses, family, and friends. If your divorce is potentially hostile, or you just want to make sure you’re adequately protected, contact TATE BYWATER, Virginia’s choice for family law. Our attorneys litigate at the trial level, along with appellate work at the state Court of Appeals. Nothing in this website should be deemed to create a contract or establish a binding contractual term between the firm and any person reviewing it. The precise terms of representation will be discussed and established at the time the attorney/client relationship is established. Confidential or time sensitive information should not be disclosed through this website. If you are seeking legal advice please contact a firm attorney directly. Case results depend on a number of factors that are unique to each case, and case results and information on this site do not guarantee or predict an outcome in a similar case. The materials on this website are meant for informational purposes only, and nothing contained in this website should be construed as legal advice. This website may contain links to other websites. Such links are provided for convenience, and TATE BYWATER is not responsible for the information of any website linked to or from this website.